There is fire on the hands, but it doesn't burn! Have you ever wanted to play with fire without those pesky burn marks? With this experiment you can light money or your hand on fire without it burning. This is a neat and relatively safe trick for all the pyromaniacs out there. It is fairly easy to do and is interesting for kids or adults. 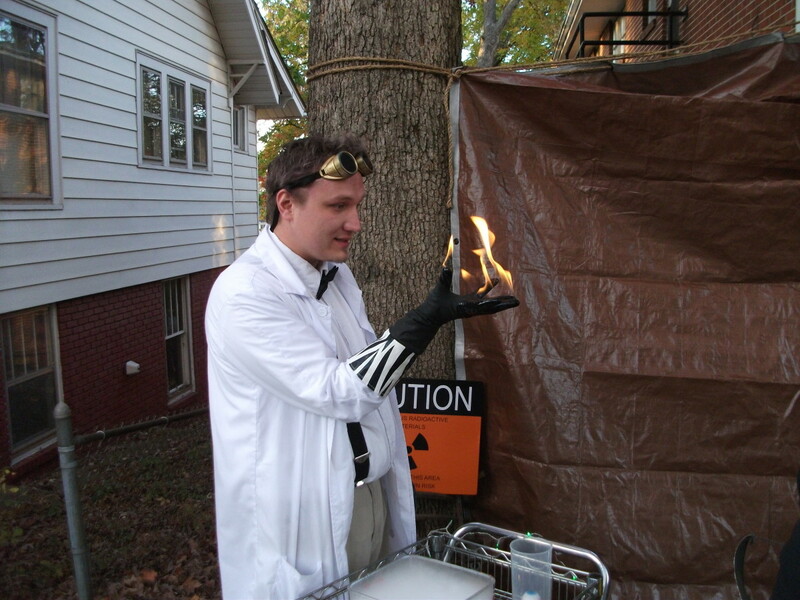 Gather your materials, practice your best evil scientist laugh, and put on a show with fire. This experiment can be very dangerous. Be very careful not to burn yourself or anything else. Kids should not try this trick without adult supervision. Follow all safety precautions when doing this. Have a fire extinguisher handy. Remember - Stop, Drop, and Roll if you do catch fire. First you will need a solution of water and alcohol. The preferred kind is ethyl alcohol. Many drugstores carry it. It is usually in a container similar to rubbing alcohol and is in the same section of the store. Isopropyl (rubbing) alcohol will also work for the experiment. Mix the alcohol and the water together into a mixture that 50% is alcohol and 50% water. Caution – the bottle of alcohol may already contain water. Most bottles of alcohol contain 70% alcohol and 30% water. The best way to get the correct mixture is to use a measuring cup. If the bottle is 70/30, pour 10 ounces straight from the bottle into the measuring cup. Then add 4 ounces of plain water. The mixture will then be 7 parts alcohol, 7 parts water, or 50/50. If the alcohol you have is not a 70/30 mixture, just keep in mind how much water is already added to the bottle (90/10 - Use 10 ounces from the bottle and then add 8 ounces of regular water). Salt can be added to the mixture to make the flame more visible. A few shakes of salt in the solution is plenty. Now pour normal water into the other container. Keep it close to the experiment in case something begins to burn. Light the candle but make sure it is away from the solution. The solution could catch fire as well, so keep it away from the fire. Before using real money, test a piece of scrap paper to make sure the mixture is right. Dip the paper in the alcohol/water solution making sure it is thoroughly soaked. Holding the paper with the tongs, hold the paper over the candle until it lights on fire. Be careful for drips, especially while the paper is over the candle. Hold the paper still. Waving it around can put the fire out or it could cause the fire to spread if it splashes or brushes against something. If the mixture is correct, the water will insulate the paper and prevent it from burning along with the alcohol. The flame will likely be a bluish color. If the paper begins to actually burn, quickly drop it into the container of normal water. If that’s the case, recheck the mixture. If the paper lit on fire without burning, try the experiment with real money. The process is the same as with the paper. Soak it in the solution. Using the tongs hold the money over the candle until the alcohol catches fire. If it begins to actually burn, quickly place it in the water container. If your mixture is right, though, the alcohol should burn on the surface while the water keeps the actual money from burning. The alcohol will eventually burn off on its own or you can dip it into the normal water to put the fire out. Now comes the awesome part. The same process can be used to light your hand on fire. 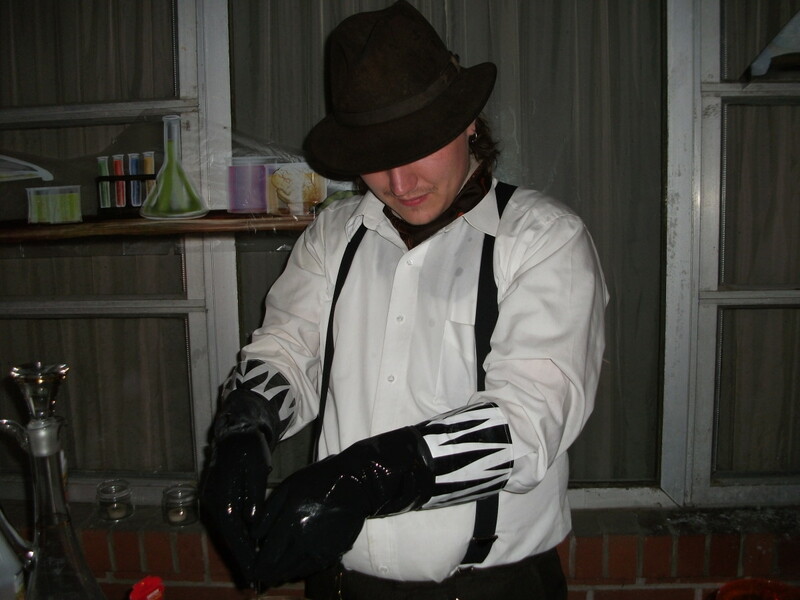 It works best if you use rubber gloves, but you can use your bare hand as well. This part is also more dangerous, so make sure you don’t have on baggy clothes or long sleeves that could potentially catch fire. Test paper before using your hand to ensure the alcohol and water are at the correct percentage. Follow the same procedure as with the paper and the money. Put on the rubber gloves and dip your hands in the solution getting them as wet as possible. Then hold your hands over the flame until your hands catch fire. The fire will begin to get hot on your hands. Make sure there is a container of normal water nearby so that you can put the fire out if it gets too hot. You can also wave your hands up and down quickly to put out the flames. Now you can hold fire in your hands and amaze your friends. Ever Wanted to Hold Fire in Your Hands? The fire burns a blue color normally. It will look more yellow with salt added. The fire burns a blue color. 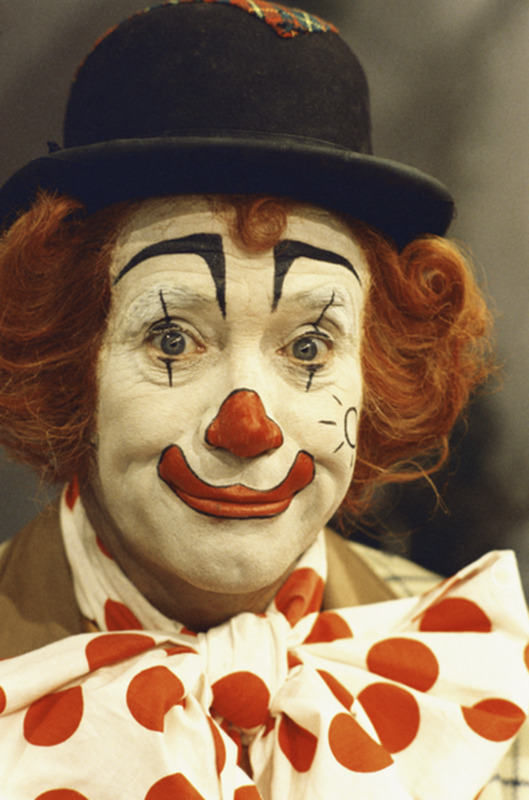 The trick with this experiment is all about science, not magic. Alcohol has a high vapor pressure, so the vapor is concentrated above the liquid on the surface of the object. The alcohol burns, not the water or the object that has been soaked. Alcohol also burns at a low relative temperature which is not high enough to evaporate the water. Thus, the water acts as insulation on the object preventing it from catching on fire. You may have noticed that the paper has a tendency to burn faster than the money when all of the alcohol has burnt away. This is because money is made of cottony material and does not burn as easily as paper does. Adding salt in the experiment serves two functions. First, it alters the color of the flame making it more visible. Alcohol by itself burns a faint, light blue color. The salt also causes the alcohol and the water to separate in the mixture adding more protection for the object. If you want to take pictures of the experiment, they will show up best at night or in a darkened room. Keep the flash off. The color of the flame won't show up with flash. 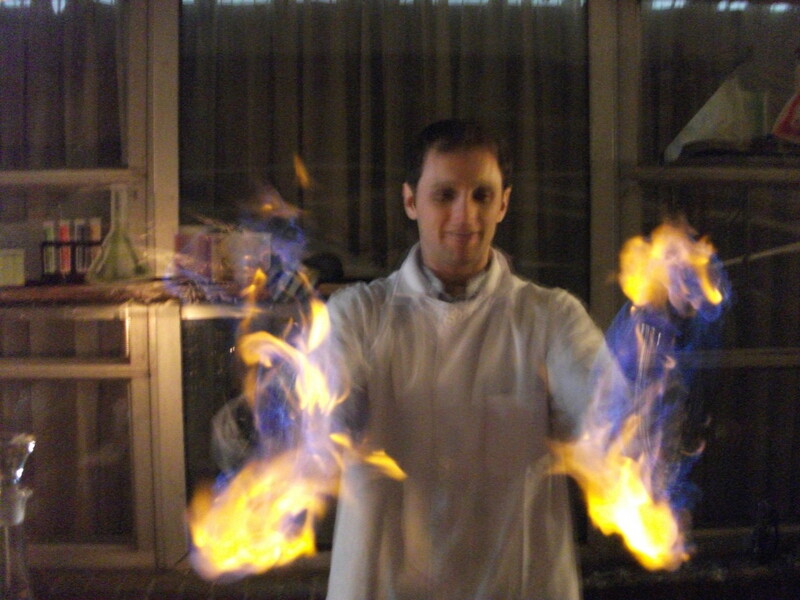 Using basic science principles you can appear to be a magician who can control fire. 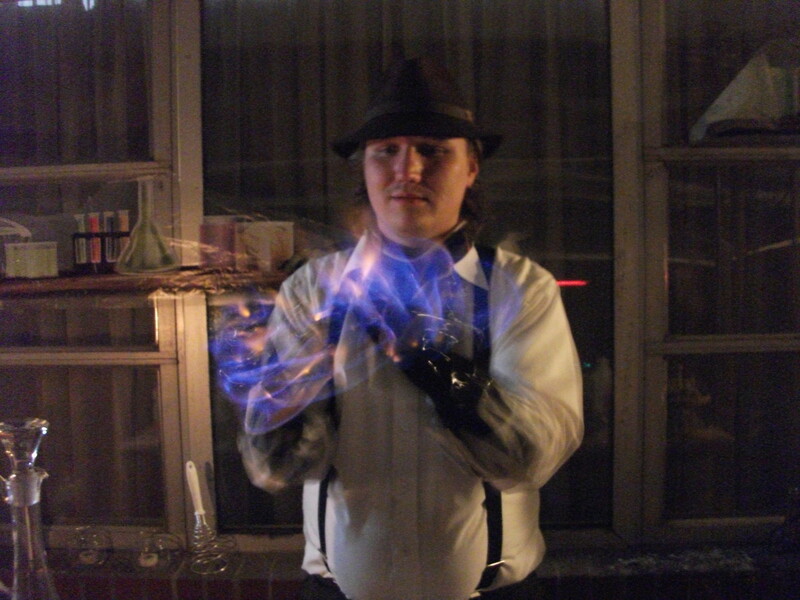 My alcohol flame experiments were to see if a "trick" firewalk could be devised. After testing the relative temperatures of the different alcohol mixes and successfully walking through a pool of the burning fuel in shorts and bare feet I had the fire part figured out. The "coals" were a 50 lab bag of plain sand and a 50 lb bag of black landscaping granite 3/4 inches in size. The setup is simple: rake the sand into into a bed about 2 inches thick, and 6 feet long on a wet grassy area at night. Pour and spread out the granite out to cover the sand and wet it down well (to keep the rocks from becoming too hot) About 1 gallon of the fuel mix will be needed (be sure to add salt to make a nice orange flame). When ready, pour the fuel in a zigzag pattern from one end of the bed to the other (the sand helps absorb and keep it there). The zigzagging is important to give your feet a chance to cool off between steps (the flames are still very hot). Make sure the area around the pile is really watered well, both to contain the fire and provide a spot to step if the heat becomes too much. Light the fuel (it looks convincingly menacing) and take a walk. You'll find the hard, slightly sharp rocks cause you to walk as if you were actually walking on coals... for people that don't know you can really fool them. Be sure not to wear long pants or loose clothing and keep a water hose ready just in case. The rocks will eventually become very hot. If you can hear the water sizzling, and the rocks become dry, its time to stop. Couple of notes on the different alcohols available: Ethanol or denatured alcohol burns with the coolest flame, isopropyl (rubbing) alcohol burns a bit hotter and has a penetrating odor. Methanol is in a class by itself. First and foremost it is extremely poisonous and can be absorbed through the skin so it is NOT advised for fire tricks. It also burns with the hottest flame, so even diluted with water it is the one most likely to burn you all other things being equal. It will also still burn with a ton of water added to it. Interesting thing about all alcohols is they all burn with a very hot flame. It is the water that keeps whatever it is you are using for the trick cool. One way to make the flames bigger is to use warm water in the mix. It will cause faster vaporization of the alcohol. The downside is that the water will heat up that much faster during the burn (water above 60 degrees is enough to scald you). You can also add firework colouring compounds to the water/alcohol mix. Barium chloride will produce a deep green, strontium chloride makes a brilliant red. Both are fairly non-toxic. One thing to keep in mind that I found out the hard way (besides taking the hair off my lower legs) is that if you turn the alcohol soaked surface downward, the flames will lick up the sides. I was able to walk through puddles of the burning mix barefoot pretty comfortably, but once I wore flip flops and the flames rolled up along the front and sides under my DRY feet. OUCH! The flames themselves are really hot! Interesting thing happened when I tried making a pool of fire about 6 feet around and walked through it I only shorts and bare feet. My feet were fine, but it burned all the hair off my legs about 10 inches up. Makes sense since my legs were not wet but my feet were. It can if the fire burns on it too long. You may need more water in your mixture to help insulate better. Is the rubber supposed to burn on the gloves??? 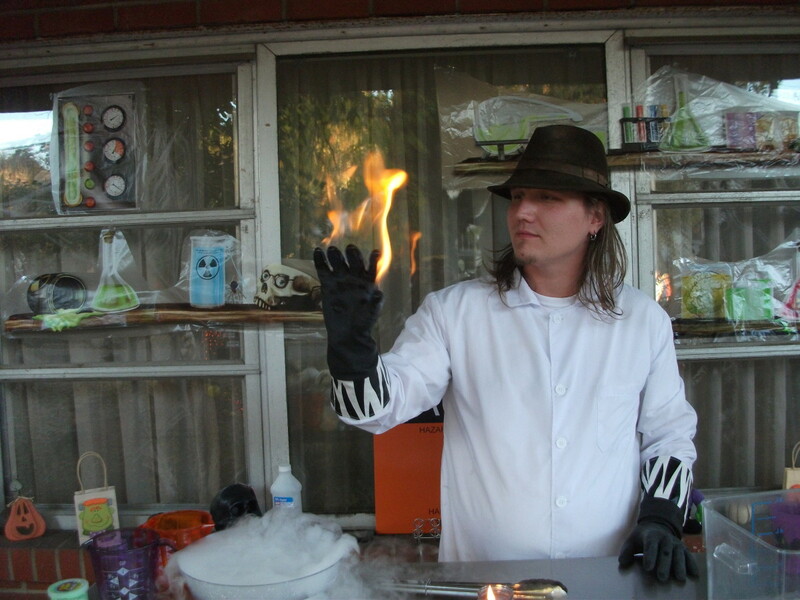 add 1 teaspoon of borax and it makes the flame green. This is a nice experiment ever,can i use black label or castle lager? K - 06/01/10 Good luck on your paper! Heyhey - It would be very dangerous to do that. You wouldn't be able to control the fire and it could burn through your clothes and severely burn your skin. Watch videos of stuntmen who are on fire. There is always a team of people ready to spray them with extinguishers as quickly as possible. Can you tell me when this was written? I am writing a bibliography for my school. Can i use this experiment on my clothes? Angel - Good luck! It is a fun experiment. I am doing this with money for my AP chemistry class, and it looks awesome... can't wait to try it. kkiara - Thanks! Glad it worked for your experiment! It is an awesome trick. jannex - There isn't really a way that will still allow for good flames. You could try spraying the rope with flame retardant, but it may make it so the rope won't burn at all. Other than that, just let the flame burn just until the point when the rope itself starts to catch fire. Jason - No, as long as you put out the fire when your hands start to get too warm. That's the point when the water has burned off. Sharkye11 - My husband does this trick for Halloween every year. The kids love it. Thanks! Dustin - Yes, you can use any grade of alcohol as long as you end up with a mixture that is 50% water and 50% alcohol. You can even use the alcohol without adding water, but it will burn and start to get hot much quicker. I am definitely gonna try this but will 92% alchohol work? Wow! Now that is a cool trick! This would be so awesome to use on Halloween or at one of our fundraising events for a little extra show! Thanks for the idea and the formula! Will this burn the hair off my hands??? i want to do it with rope , may i know how to make the burning last longer? Tristin - There was a typo in the mixture. It was supposed to be a 10 instead of a 7. It's fixed now. ciaralw - Thanks! Playing with fire can be scary, but if you use safety precautions it can be relatively safe. Very cool and thorough. You gave readers confidence in a normally scary thing. Great hub. sanju - Alcohol is not the only chemical that would work. It is just a common household ingredient that is relatively safe to use. Chemicals that burn with low relative temperatures are likely to work as well. They might be dangerous to experiment with, though. why only alcohol make it burn? 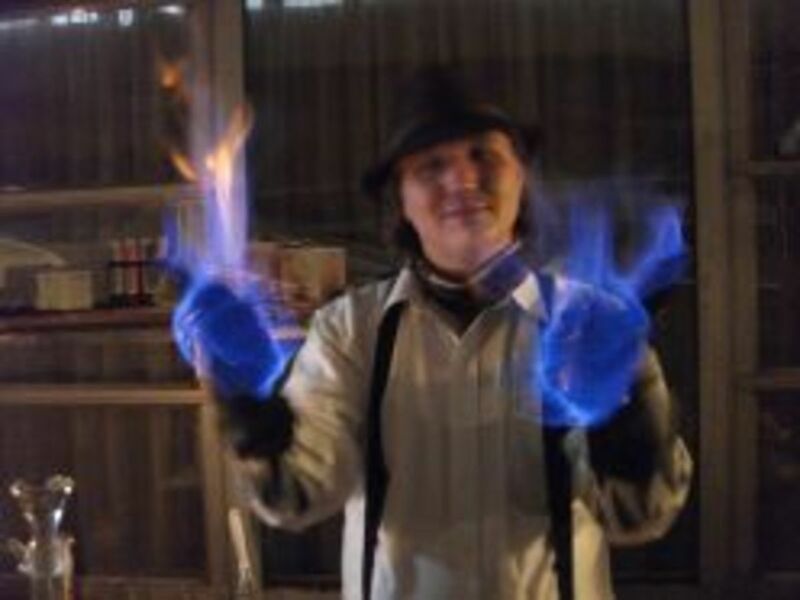 ConorJ - You can use your bare hands and light them on fire. The gloves just make it a bit easier and allow you to keep the fire going longer before it gets too hot. Just follow the directions for the mixture above and use your hands. When the water starts burning off and it gets too hot, just stick your hands in the bowl of water. is there any way to appear to be holding it with bare hands? jaquille pritchard - It's a neat trick and pretty easy. noahmiller - Glad it was fun. It doesn't hurt as long as you are doing it correctly. No, it doesn't hurt. Your hands will start to get hot as the water burns off usually after 30 seconds or a minute. Then you just dip your hands in the water. If you are wearing gloves it takes longer for your hands to start feeling warm. Does it hurt to put fire on your hands like that? Thank you for the comments everyone. Hope this info will "light" up your day. Fun hub! It is so cool. Ouch Huh ;-) Nice Hub Very well done! Very well done hub! One of the best ones I have seen in a while. You can tell you really put a lot of thought and time into this. 2 thumbs up!